The Swiss NGO Bruno Manser Fund (BMF) had its website brought down by a cyber-attack today, 26th February. The ‘break-in’ appeared to be a highly professional hack, according to the NGO’s web-team and it comes at a crucial moment politically for Taib Mahmud, who is facing a local and international campaign for a Clean Governor, waged against his planned appointment to the post on Friday. BMF is also the focus of considerable publicity in Switzerland today, surrounding the publication of a major expose of Taib’s corrupt management of Sarawak with the book ‘Rainforest Robbery’, authored by the NGO’s Director, Dr Lukas Straumann. The book which is being launched in German, but will soon be available in English translation, details the history of Sarawak since independence and the hi-jacking of the wealth of the state by the Taib family over the past 40 years. “For the first time we have a comprehensive account of the story of the theft of the Rainforest in Sarawak and the betrayal of its people”, Manser’s friend Kaspar Muller informed Sarawak Report. 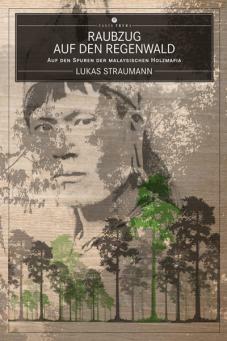 The book also covers the history of the campaigns to try to halt the forest destruction and support the native rights of the indigenous peoples, whose plight is movingly described. Bruno Manser, who mysteriously disappeared in 2000 while campaigning for the rights of the Penan in the Sarawak interior led the early resistance to Taib’s logging destruction. Following his demise the book details the investigation into Taib’s extraordinary wealth and his investments across the globe, an investigation taken on largely by the Bruno Manser Fund, which has continued in his memory. “Taib is the Rainforest Robber, but it is extraordinary to see how one man and his cronies could destroy a habitat that was thousands of years old in just one generation and how businessmen from a number of countries have helped him hide his fortune”, says Dr Straumann. Swiss television and radio have been giving full coverage to the publication of the book, which officially launches at an event in Basle this evening. Taib’s upcoming plan to be installed as Governor of Sarawak on Friday. BMF has been at the forefront of an international campaign by NGOs to warn the Prime Minister, Najib Razak, that appointing Taib would make himself and the Malaysian Government complicit in the corruption of the out-going Chief Minister of Sarawak. “It is telling that whenever there is an important political event, like an election or this appointment of Taib, they attempt to stamp out publicity. It seems they like a media blackout at times of transfer of power”, said Dr Straumann.